The circle of life starts with a mother and child and then grows from there. 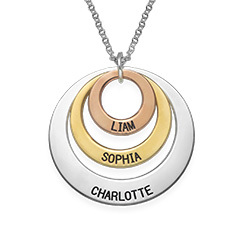 For a mom of two, the Triple Circle Family Necklace in Sterling Silver is a perfect gift and the chance to show mom how much you love her. 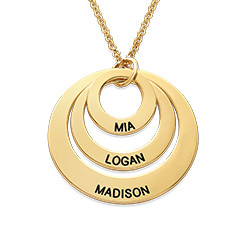 The triple rings, each of a different size, can be engraved with one family member’s name. Go for your mom’s name, your name and your sibling’s name or, if you’re an only child, add your dad’s name. Your mother will love this necklace and will love you even more for giving her this gift. View our collection for more discs and circles necklaces.